In recent years, there has been a growing realization that much of the success in the application of industrial robots to manufacturing might also become true for mobile robots in the service sector. In particular, robots that could serve as personal assistants for people---especially those who are elderly or physically challenged---are moving from fantasy to the realm of the possible. The rapid progress in computing and the growing body of knowledge in robotics are leading us toward a goal which could have many benefits for society. The human-machine interface is a key area of interest, particularly in the physical interaction between the robot and person. 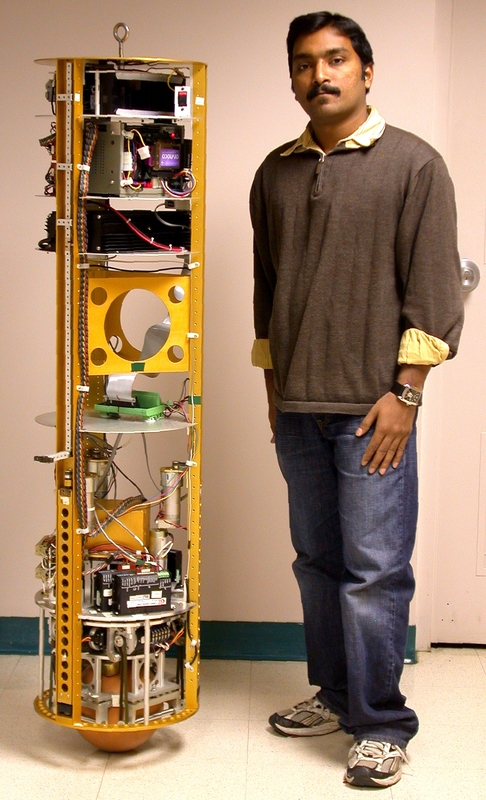 Industrial robot arms and research mobile robots are position-controlled (rather than force-controlled) devices which are heavy and clumsy. Their motions cannot readily accommodate to an environment made for people. 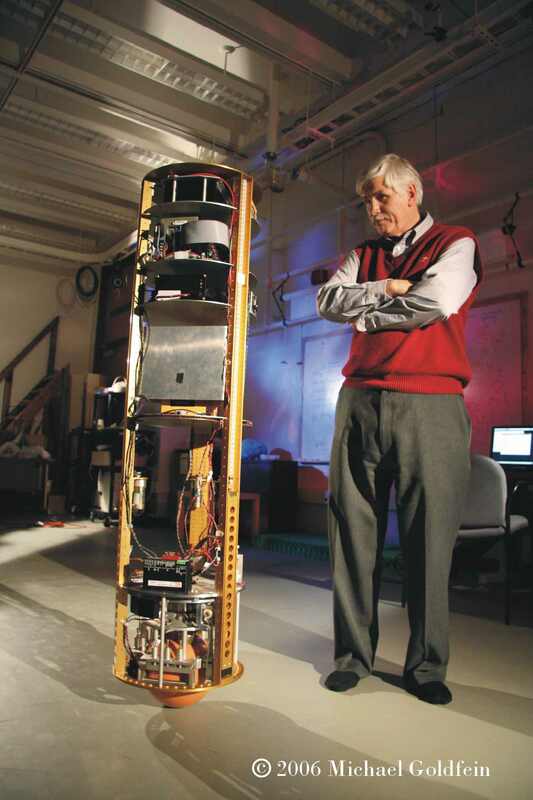 Mobile robots that locomote with wheeled drives are slow and awkward, with wide bases providing static stability. What is needed is an entirely different approach to locomotion: mobile robots that are safe; dynamically agile and capable of graceful motion; slender enough to easily maneuver in cluttered, peopled environments; and which readily yield when pushed around. Intelligent machines of this sort can only be achieved with dynamic stability. Our research goal is to gain a deeper understanding of how such dynamic agility can be achieved in mobile machines interacting with people and operating in normal home and workplace environments. We are developing novel dynamically-stable rolling machine and walking machine research platforms to study this issue. We will evaluate the efficacy of this type of dynamic locomotion in the context of human environments. Significant insights will be gained from this research toward producing agile motive platforms which in the future could be combined with the research community's ongoing work in perception, navigation, and cognition, to yield truly capable intelligent mobile robots for use in physical contact with people. 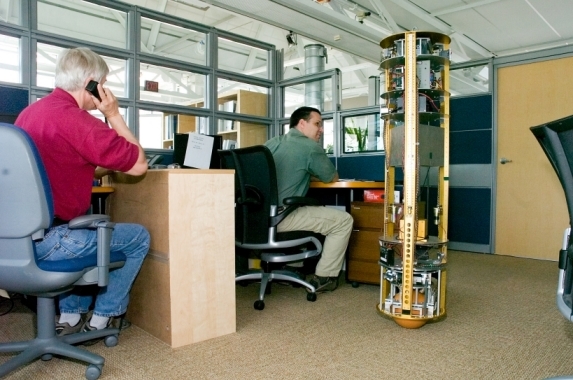 Such robots could provide many useful services, especially for the elderly or physically challenged, in their everyday work and home environments. Many other uses such as entry into hostile environments, rescue in buildings, and surveillance to safeguard people or property can be envisioned. "Trajectory Planning and Control of an Underactuated Dynamically Stable Single Spherical Wheeled Mobile Robot"
"State Transition, Balancing, Station Keeping, and Yaw Control for a Dynamically Stable Single Spherical Wheel Mobile Robot"
"Human-Robot Physical Interaction with Dynamically Stable Mobile Robots"
"Dynamic Constraint-based Optimal Shape Trajectory Planner for Shape-Accelerated Underactuated Balancing Systems"
"Hybrid Control for Navigation of Shape-Accelerated Underactuated Balancing Systems"
"Integrated Planning and Control for Graceful Navigation of Shape-Accelerated Underactuated Balancing Mobile Robots"
Balancing Mobile Robot with Arms"
Carnegie Mellon University press release, August 9, 2006. 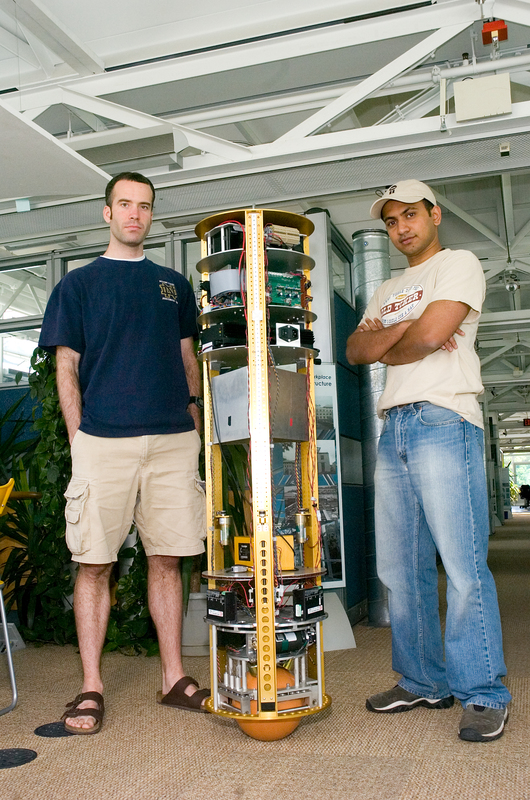 Graduate students Eric Schearer (left) and Anish Mampetta (right) with Ballbot, photographed in the CMU Intelligent Workplace. 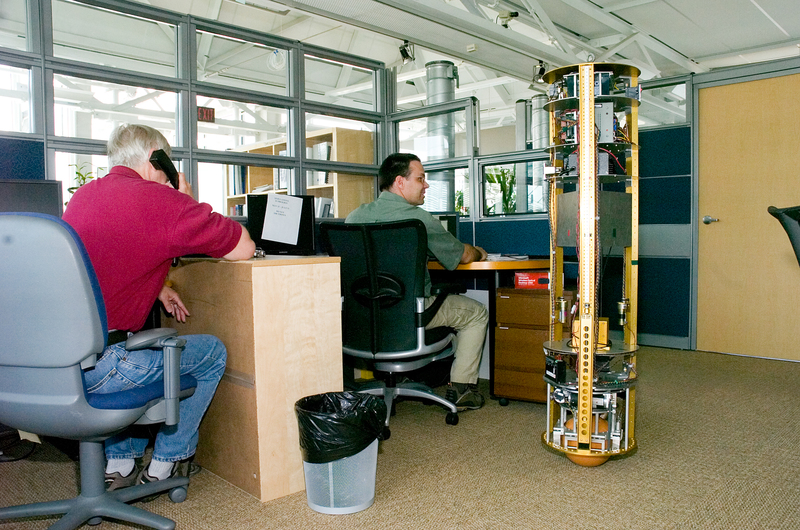 Ralph Hollis (left) and George Kantor (right) with Ballbot, photographed in the CMU Intelligent Workplace.